In Treadmillasaurus Rex you are a T-Rex (or a Treadmillasaurus Rex, I can’t tell the difference between the two) who is running a treadmill. 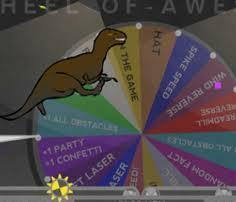 You get to spin the wheel of awesome to get random things such as confetti, or wind. You also have spikey balls coming at you that can kill you. Their is no real point to the game other than to have fun.